Versatile marine-grade enamel for use above the waterline on exterior & all interior surfaces. Ideal for topsides, coamings, bulkheads, cabin ceilings, cabinets, compartments, lazarettes, lockers, trim and more. Durable, washable finish resists fading and discoloring. Environmentally-friendly low-odor, low VOC water-based formula dries fast, with simple soap and water cleanup. Great for cabin tops, cabin sides, wheelhouses, coamings, decks, hull sides, boottops, cabin ceilings, doors, walls, trim, drawers, lazarettes, lockers, heads, bulkheads, and galleys. Tired of looking at tired-looking topsides whose old gelcoat or worn paint can’t be revived? Have new surfaces that need a beautiful, long-lasting, semi-gloss finish? 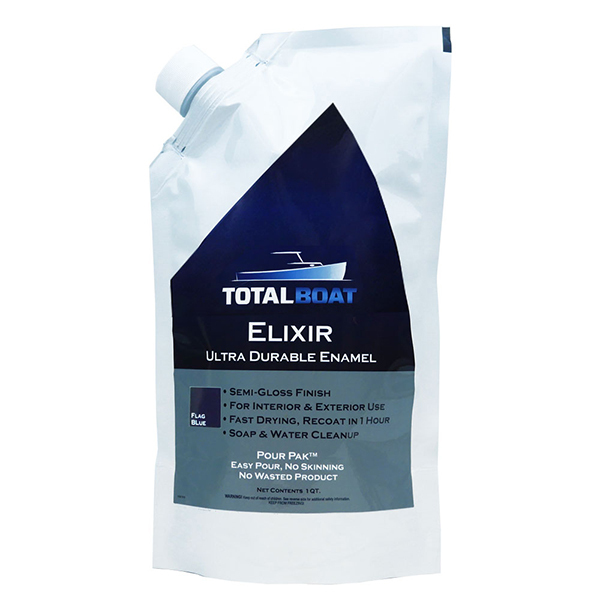 TotalBoat Elixir transforms bare or blah into beautiful quickly and easily with its high-performance, low-odor, water-based, self-priming enamel formula that can be applied directly to properly prepared metal, fiberglass, and wood surfaces—no priming necessary. It can also be applied over previously painted surfaces in good condition—whether oil or water based, unlike other marine water-based topside paints. Elixir performs like an oil-based alkyd marine paint in that it’s tough enough to prevent damage from abrasion, scratching, staining, and solvent spills, it’s UV stable to prevent fading, cracking, lifting, and peeling, and it’s mildew resistant. But that’s where the similarities end. The downside of oil-based paints is their toxic fumes, long drying times, and messy cleanup. Elixir’s water-based, environmentally friendly formula has almost no odor, it dries so fast you can recoat in just 1 hour @ 72°F (and apply up to 5 coats in just 1 day! ), and it’s very easy to clean up with just a little soap and warm water. Another plus for Elixir is that its attractive semi-gloss finish and depth of color improve the more coats you apply. It also comes in a unique Pour Pak™ bag that allows mess-free pouring and easy storage of any unused paint. Elixir is smooth, hard, and durable, but scuffs happen, and damage can easily be repaired, unlike other marine enamels. With just a little prep work, light sanding, and a little bit of Elixir, it’s easy to make any surface damage disappear. 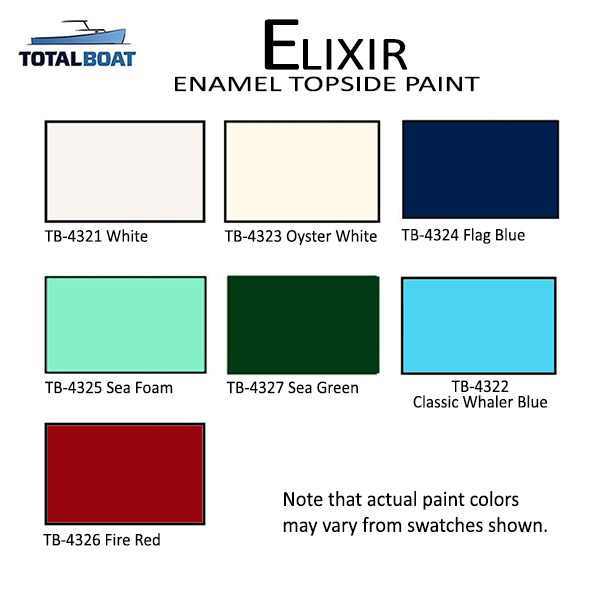 Which is good news, because boats see a lot of weather and wear & tear, making Elixir ideal for cabintops, cabinsides, wheelhouses, decks, boottops, hullsides, coamings, cabin ceilings, headliners, heads, bulkheads, berths, galleys, lazarettes, lockers, doors, trim, cabinetry, and drawers. Elixir’s semi-gloss finish has a warm, satiny glow that’s low glare and easy on the eyes on sunny days. It also hides surface imperfections better than high-gloss marine paints. The cured surface is also washable, so any dirt or spills can be wiped away easily, making it look like as beautiful as it did when you first painted it. Application methods: Brush, roll and tip, or spray. For brushing, use a tapered polyester brush; for rolling, use a high-density foam roller cover.